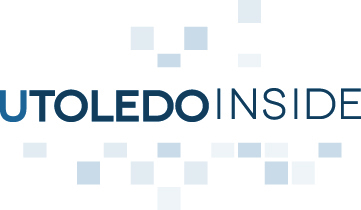 Join University of Toledo President Lloyd Jacobs and host Larry Burns, UT vice president for external affairs, for UToledo Inside Wednesday, Feb. 5, at 11 a.m. in the Student Union Trimble Lounge. Guest Mike O’Brien, vice president and director of intercollegiate athletics, will help Burns and Jacobs preview UT’s Fourth Annual Tie One On event at the men’s basketball game at 7 p.m. Wednesday night. Jefferson Award honorees Yelena Zhernovskiy, Andrew O’Donnel, Cindy Reinsel and Hannah Konnagen will be recognized. Dr. William Messer, UT’s new vice president for research, will discuss the path he sees University research taking in the years ahead. He will be joined by Dr. Amanda Bryant-Friedrich, associate professor of pharmacy, and Dr. Michael Weintraub, associate professor of environmental sciences, who will discuss their research efforts. Provost Scott Scarborough will be joined by Dr. Penny Poplin Gosetti, dean of the Judith Herb College of Education, and Daniel Steinbock, dean of the College of Law, to discuss the college strategic plans being developed and implemented. As UT begins its budget development process, David Morlock, executive vice president for finance and administration, will discuss the timelines and conversations that will lead to UT’s fiscal year 2015 budget. And, as always, Jacobs will answer questions in person, through UT’s Facebook and Twitter accounts, and through email at townhallquestions@utoledo.edu. UToledo Inside will be streamed live at video.utoledo.edu. Shows are archived on UT’s YouTube account. The top level of the East Parking Ramp will reopen Monday, Feb. 3, following the completion of emergency structural repairs. Ongoing maintenance and repair work will continue in the parking ramps. Those using the structures are reminded to be careful when walking or driving near areas where repair work is taking place and to never cross the barricades around construction zones. The University has worked on portions of both parking garages beginning in September when contractors conducting inspections as part of scheduled maintenance discovered the need for emergency repairs. Temporary emergency measures were implemented immediately and resulted in partial closures for the remainder of fall semester. The West Parking Ramp and the lower three levels of the East Parking Ramp opened Jan. 6 while the top level remained closed for needed repairs. A third-year UT medical student is being recognized on a national scale for his research on post-traumatic mental health. 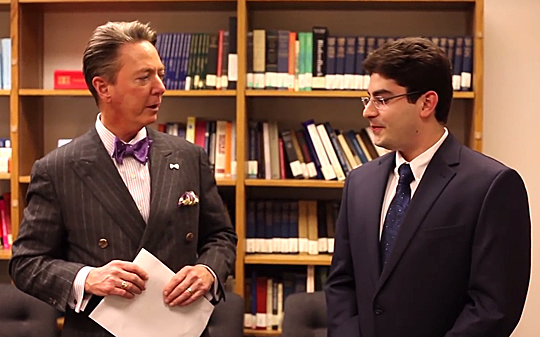 Lawrence J. Burns, vice president for external affairs, talked with Bryan Lubomirsky, third-year medical student, about his research on post-traumatic mental health for a “Tower Views” video. The paper outlines his research on the factors that protect patients from developing post-traumatic stress disorder (PTSD). Under the supervision of Dr. Xin Wang, UT assistant professor in the Department of Psychiatry, Lubomirsky was able to conduct his research with patients at The University of Toledo Medical Center. Lubomirsky’s research suggests that patients having bedside visitors and using family or friends to transport them home from the emergency department is a low-cost, effective way to reduce post-traumatic stress. The research used a scoring method to track visitation and when family provided transportation home from the emergency department, as well as the patient’s levels of anxiety, stress and depression. Patients with visitors and family transportation showed decreased anxiety and depression scores at two weeks after they were discharged and decreased PTSD stress scores at three months. The annual Stanley M. Kaplan Essay Contest calls for entries of topical essays, case reports, review articles or original research that was conducted in a medical school with a student as first author. Other winners in Lubomirsky’s company include medical students from Mt. Sinai and Yale University. “This prestigious award is not only an outstanding achievement of Mr. Lubomirsky as a medical student, but also a good demonstration of the great academic learning environment at UT’s medical school,” Wang said. Lubomirsky’s research has been presented at the International Conference on Social Work in Health and Mental Health, and his essay has been accepted by the journal Social Work in Mental Health for publication early this year. He is also a member of Wang’s student team that won the 2013 Interprofessional Student Research Award at UT. Since the initial launch of Intern in Ohio last March, nearly 2,500 new internship opportunities have been posted by almost 400 companies. Students who are seeking internships and co-op opportunities for spring and summer positions are encouraged to register on Intern in Ohio at interninohio.com to use the free web-based program that helps connect students and employers through an online matching system. Intern in Ohio continues to offer a growing network of opportunities and quality matches between candidates and employers based on skills, interests and requirements. • Stay active — log in every 30 days. • Complete your profile — fill out all sections for school, major, class level and GPA. • Skill sets — pick one to two skill sets and answer all questions. • Respond to requests — accept or deny employer requests within seven days. Faculty and advisers also are encouraged to use the system to help their students who are looking for spring and summer internships or co-op positions. The UT Chapter of Engineers Without Borders has been honored as the Premier Student Chapter for the Great Lakes Region. The award, which was presented in November at the regional conference in Cincinnati, goes to the chapter that meets the ideals of a successful chapter of Engineers Without Borders-USA, which is a nonprofit humanitarian organization established to partner with developing communities worldwide to improve their quality of life. The UT chapter was recognized for excelling in organizational structure, fundraising through grant writing and public relations efforts, positive mentoring relationships, and outstanding chapter and regional participation. This was the first time the UT chapter has been awarded Premier Student Chapter for the region and the first time that a member was present at the regional conference. “Overall, it was a great conference to show how involved our chapter is and how we’ve been able to grow over the past year as we restructured our e-board and applied for a second international project. We are extremely proud of this chapter,” said Katie Burns, a civil engineering major and corporate sponsorship chairperson of the chapter. The chapter is continuing work on its bridge project in Los Sanchez, Honduras. During the rainy season, the Rio Buscagua separates the village from the nearby town that offers health care, education, supplies and job opportunities. The UT chapter is in the design phase of the bridge project to keep the village and towns connected, with plans to travel this spring to begin implementation. The University of Toledo will continue its effort to become a more environmentally friendly campus as RecycleMania kicks off next month. RecycleMania is an eight-week competition for schools across the United States and Canada. UT will join more than 300 schools that will participate in the contest beginning Sunday, Feb. 2. Items that can be recycled include electronics, office paper, magazines, aluminum and plastics. At the close of each week, UT will submit the weight of recycled materials collected to be ranked in various categories, including the most overall recycled. The winning schools will be recognized nationally and receive an award that is made out of 100 percent recyclable materials. UT and other Mid-American Conference schools also compete against each other to see which can recycle the most. Last year, UT placed in the top three of the MAC division in the categories of paper, corrugated cardboard and plastic bottles. The University also will host a campus contest between residence halls. Parks Tower won last year’s competition, followed by International House and Carter Hall. The winning residence hall will receive a plaque and another prize that has yet to be determined. Students, faculty and staff are encouraged to participate in the competition, Mason added. For more information, visit recyclemania.org or contact Mason at brooke.mason@utoledo.edu. 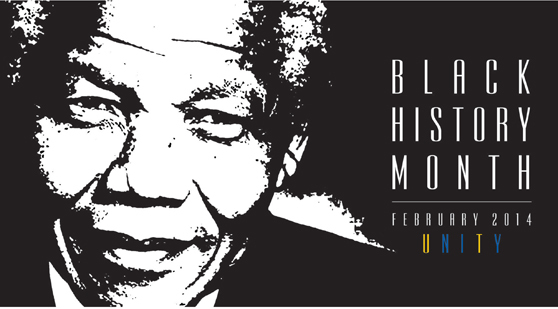 “Unity” is the theme of The University of Toledo’s celebration of Black History Month. During February, offices, departments and student organizations have planned several events. “Our theme this year was chosen to signify efforts of the institution and University community to unite in celebration of history, culture and excellence,” said Mérida Allen, associate director for the Office of Excellence and Multicultural Success, and chair of the Black History Month Committee. “There are two signature events we would like to highlight and encourage our entire University community to support: the kickoff luncheon featuring Professor Yanick Rice Lamb from Howard University on February 8 at noon and the unveiling of the Dr. Lancelot Thompson Meeting Room February 19. Email oemss@utoledo.edu to RSVP for these exciting events,” she said. In addition, the Office of Excellence and Multicultural Success is holding an essay contest for UT students who have a GPA of 2.5 or higher. The prize: a $200 gift card to the Barnes & Noble University Bookstore. Applications and essays are due by 5 p.m. Monday, Feb. 24. For more information, contact Allen at merida.allen@utoledo.edu or 419.530.3824. The winner will be notified by email Friday, Feb. 28. • Black Student Union Bake Sale, noon to 2 p.m., Student Union tables. • Ice Cream Social, “LGBTQA and the Black Community,” noon to 2 p.m., Student Union Room 2500. This event will be hosted by Spectrum and the Office of Excellence and Multicultural Student Success. • Black Student Union Meeting, “Culture,” 7:30 to 9 p.m., Student Union Room 2592. • Africana Studies Brown-Bag Lecture, 12:30 p.m., Student Union Room 3016. Topic: “The Role of the Community and Minority Media in the 21st Century.” Speaker: Fletcher Word, co-owner and publisher of The Sojourner’s Truth, a weekly newspaper in northwest Ohio. • Student African-American Brotherhood Proactive Leadership Program, “Where We Came From, Where We Are Going,” 8 p.m., Student Union Room 2591. • HIV/AIDS Awareness, 6 p.m., Student Union Room 2592. • Harlem Renaissance Night, “A Tribute to Black Poets,” 7 to 9 p.m., Rocky’s Pub and Grill. • Kickoff Soul Food Luncheon featuring award-winning journalist and author Yanick Rice Lamb, noon to 2 p.m., Student Union Auditorium. RSVP: oemss@utoledo.edu, 419.530.2261. • Minority Study Abroad Informational and Diversi-Tea, 11 a.m. to 1:30 p.m., Center for International Studies and Programs, Snyder Memorial Building Room 1000. • Dance Workshop, “I Like the Way You Move,” 7 to 9 p.m., Health Education Center Dance Studio, Health Science Campus. • “Bad Credit: Why Do We Have It?” 8 p.m., Student Union Room 2591. • Black Cinema, 11 a.m. to 3 p.m., Student Union Room 2500. • Black Jeopardy, 7 to 9 p.m., Student Union Room 2582. • “When and Wear: Appropriate Dress,” 7:30 to 9 p.m., Student Union 2591. • Unveiling of the Dr. Lancelot Thompson Meeting Room, 6:30 p.m., Student Union Room 2592. The renovated space will be named to honor the professor emeritus of chemistry, who also served as vice president for student services for 22 years. • Black Student Union Rec Night, 10 p.m., Student Recreation Center. • Africana Studies Brown-Bag Lecture, 12:30 p.m., Student Union Room 2579. Topic: “African-American Genealogy: An Amazing Journey Through Time.” Speaker: Debra Middleton, secretary 2 in the UT Department of Mathematics and Statistics. • Cards Galore, Black Student Union event, 7:30 p.m., Student Union Auditorium. • Student African-American Brotherhood Movie Night, “The Butler,” 8 p.m., Student Union Room 2591. • Black Student Union Fashion Show, “Color Me Bad,” 6 to 9 p.m., Student Union Auditorium. Tickets: $10, $15 VIP available at Ask Rocky on second floor of Student Union. • UT Gospel Choir Concert, 6:30 p.m., Body of Christ Church, 5612 W. Bancroft St. Free event; donations welcome. • Student African-American Brotherhood Teachable Moment, 8 p.m., Student Union Room 2591. All events are free except the Black Student Union Fashion Show. For more information, contact the Office of Excellence and Multicultural Student Success at 419.530.2261. Friday, Feb. 14, is the deadline to submit an application for a grant from Women & Philanthropy at The University of Toledo. 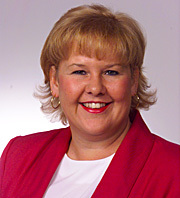 Women & Philanthropy was chartered in 2006 and made its first award to the University in 2008. Through this giving circle, members of diverse backgrounds and interests work collaboratively and pool their charitable gift dollars to make positive, meaningful and immediate impacts at the University. In six years, the group has gifted $214,931 in 10 grants to the University, according to Chris Spengler, director of advancement relations in Institutional Advancement, member, and administrative contact for Women & Philanthropy. Through their generous support, members of Women & Philanthropy have created a permanent legacy at The University of Toledo, Spengler said. Women & Philanthropy is seeking grant applications for 2014. All UT staff, faculty and students are eligible to apply. The grant guidelines, application form, and information on previous grants can be found on the Women & Philanthropy website. Members of Women & Philanthropy will review the grant applications, and the recipient(s) will be announced in early May. Senior Andola Dortch was named to the watch list for the 2014 Nancy Lieberman Award, which recognizes the top point guard in women’s NCAA Division I college basketball. Candidates exhibit the floor leadership, play-making and ball-handling skills of Naismith Memorial Basketball Hall of Famer Nancy Lieberman. 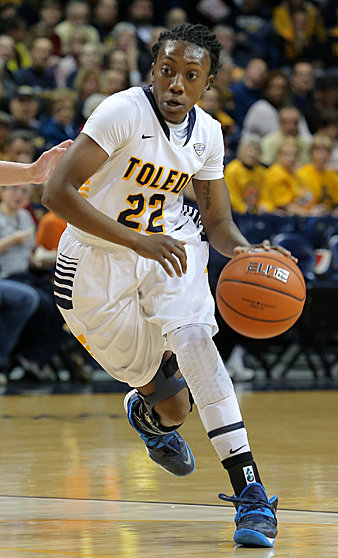 Dortch is one of 29 players on the watch list and one of only two from the Mid-American Conference, along with Akron’s Kacie Cassell. Dortch is the catalyst in the Rockets’ offense, averaging 11.4 points, 3.7 rebounds, a team-high 4.9 assists and a squad-best 2.6 steals in 37.8 minutes per game in 2013-14. As of Jan. 23, the 2012-13 first-team All-MAC selection ranked second in the MAC in helpers, third in thefts and assist/turnover ratio (2.1, 79-38), fourth in minutes played and 21st in scoring. The 2013-14 Preseason All-MAC West Division Team selection has scored in double figures on nine occasions this year, including a season-high 22 points, four helpers, two boards and two thefts in a squad-best 37 minutes vs. nationally ranked Purdue Nov. 17. Besides being an outstanding scorer, Dortch is UT’s defensive specialist. The two-time MAC Defensive Player of the Year has collected at least four steals on a team-high four occasions in 2013-14, including a season-high six vs. Valparaiso in the second game of the Toledo Invite Dec. 7. As of Jan. 23, Dortch sits third in UT annals in career steals (263) and minutes played (3,575), sixth in assists (454), eighth in free throws made (324) and free throws attempted (467), and 14th in scoring (1,243). Previous winners of the Nancy Lieberman Award include last year’s recipient Skylar Diggins (Notre Dame), along with Sue Bird (Connecticut), Renee Montgomery (Connecticut), Diana Taurasi (Connecticut), Lindsey Harding (Duke), Courtney Vandersloot (Gonzaga), Temeka Johnson (LSU), Kristi Toliver (Maryland), Ivory Latta (North Carolina) and Andrea Riley (Oklahoma State). The list will be narrowed down to a final 20 in February, then the final five by March. The Lieberman Award winner will be announced during Final Four weekend activities. How do you publicly salute the giving heart? Is it possible to recognize someone’s extraordinary passion for service to others? Dr. Kaye Patten Wallace thinks so. However, Patten Wallace had a particularly extraordinary employee in mind as the model and namesake for an award that was instituted last year. Diane Hymore, director of senior administration operations and longtime executive secretary to President Lloyd Jacobs, was honored last April as the first recipient of the Diane Hymore Exemplar of Excellence Award. Nominations are open for the 2014 award, which will be presented to an individual whose work defines the core values of the University in Hymore’s spirit of support, encouragement and service. She noted that Hymore, who worked at the University from 2001 until her retirement in 2013, never sought recognition: “She was very humble about her contributions, but she lived our core values of respect and kindness toward others, from students to visitors to faculty and other staff. The deadline for nominations is Friday, Feb. 21. The nomination form may be found online at http://utole.do/hymore or you may obtain one via email by contacting cynthia.nowak@utoledo.edu. Send completed forms to the same email or fax a printout to 419.530.8567 or send it to Mail Stop 963.